If a trip to Europe is in your future, then consider an extended layover in Reykjavik, Iceland; a teaming metropolis filled with cultural diversions, modern hotels and interesting people. And the good news is, you can stopover for free if you fly Icelandair to the Continent. Even better, this budget carrier offers some of the lowest European airfares to be had. Access hasn’t been overlooked in this European capital either, as accessible transportation, attractions and hotels are plentiful. Bottom line — Reykjavik is an excellent choice for wheelers and slow walkers. All international flights arrive at Reykjavik International Airport, which is about an hours drive from downtown Reykjavik. Although a taxi ride into the city will set you back some $120, Flybus (+354 580 5400, www.flybus.is) offers an accessible and affordable alternative. For just $24, you can take Flybus from the airport to your Reykjavik hotel or the BSI Bus Terminal. Although their entire fleet is not accessible, with advance reservations they can schedule an accessible bus for your run. Their accessible buses can accommodate both manual and power wheelchairs. You can make your reservation online, print out your ticket, and you’re good to go. And if your plane is late, no worries, as Flybus will wait for you. Getting around town is easy too, as Hreyfill Taxi (+354 588 5522, www.hreyfill.is) offers accessible taxi service around the capital city. Accessible day tours can also be arranged through Hreyfill, with advance notice. Lastly, the most affordable way to get around Reykjavik is on Straeto (+354 540 2700, www.straeto.is), the city bus line. The fleet features bright yellow kneeling buses which are accessible to wheelchair-users and slow walkers. Best of all, they stop at or near all of the major attractions and hotels. Just download a schedule from their website and get ready to explore Reykjavik. The best place to begin your Reykjavik adventure is at Hallgrimskirkja (www.hallgrimskirkja.is), the largest church in Iceland and a city landmark. 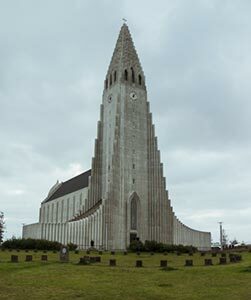 Designed by state architect Guojon Samuelsson, the church was built to resemble the basalt lava flows of Iceland’s landscape. It took an astonishing 38 years to complete the building, and today it’s visible from just about anywhere in the city. 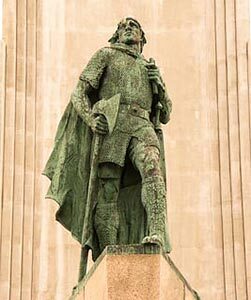 A statue of Leif Erickson graces the front of this striking sanctuary, which offers level access through the courtyard. Inside, you’ll find a massive pipe organ on the back wall, and a center aisle framed by a magnificent archway. Indeed the architecture on the inside is just as beautiful and intricate as that on the outside. For a small fee, you can take the elevator up to the eighth floor. From there a stairway leads up to the top viewpoint. The windows on the lower landing are too high for wheelchair-users, but if you can stand you can enjoy the view on either level. Even if you can’t manage the steeple, the church is still worth a visit for the architecture. One word of warning though. It’s best to take a taxi to this Reykjavik landmark, as the path of travel is a bit uphill and the sidewalks are in disrepair in some places. Although some of the side streets in downtown Reykjavik are not a good choice for wheelchair-users, the main drag – Laugavegi – has wide level sidewalks with curb-cuts at every corner. It’s filled with shops and cafes and although some have a few steps at the entrance, many are accessible. Even if you only window shop, it’s a great place to people watch. 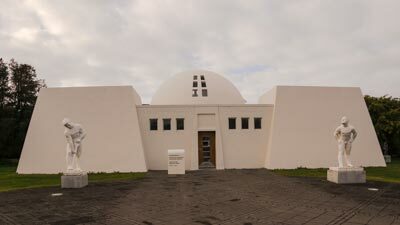 One of Iceland’s most unusual museums is also located on Laugavegi. 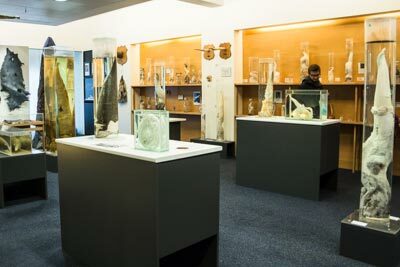 The Icelandic Phallological Museum (+354 561 6663, www.phallus.is/en) is home to a collection of more than a hundred penises and penile parts, of all the land and sea mammals that can be found in the country. There’s level access to the museum and plenty of room to wheel around and look at the collection, which even features a few human specimens. The museum also includes a collection of three hundred phallic artistic creations, from earrings and figurines to a flute, a coffee cup and even salt and pepper shakers. Round it out with an interesting folklore collection and you have all the makings for a truly memorable experience. And don’t miss the gift shop, which goes a step beyond the usual t-shirts and shot glasses. It you’d prefer something on the more traditional side, then check out the Asmundarsafn Sveinsson Sculpture Museum (+354 553 2155, www.artmuseum.is). 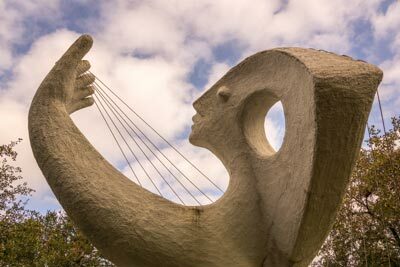 Part of the Art Museum of Reykjavik, the museum features a sizable sculpture garden, as well as a collection of the sculptor’s work in his former studio and home. There’s level access to the front entrance, and although there are three steps up to the reception area, there is also a portable ramp that can accommodate manual wheelchairs. Alternatively, the side door can be opened by an employee for level access to the gallery. The cube structure with slanted walls and a dome roof was designed Asmundarsafn Sveinsson, and it’s the perfect venue to display his work. The dome part of the building is only accessible by stairs, but there are only a few works on display up there. Outside there’s barrier-free access through the sculpture garden, which features 30 of Sveinsson’s larger works. It’s a nice place to relax and enjoy mother nature, and there’s also a picnic table if you’d like to enjoy an al fresco lunch. Located close to the Asmundarsafn Sveinsson Sculpture Museum in Reykjavik’s financial district, the Hilton Reykjavik Nordica (+354 444 5000, www.hilton.com) is a good lodging option for wheelchair-users and slow walkers. This contemporary property features level access to the lobby area, with barrier-free access to the adjacent lobby bar and Vox restaurant. There is elevator access to all floors, with good access to the meeting rooms on the second floor. The accessible guest rooms have wide doorways, and there’s plenty of room to maneuver a wheelchair inside the spacious accommodations. Wood floors make for easy rolling, and the bathrooms are equipped with roll-in showers and grab bars. Round it out with a lowered clothing bar in the closet and you have all the accessible comforts of home. And for safety, they even have an evacuation chair on hand. As an added bonus, guests also receive a free bus pass, good for the length of their stay. And don’t miss the massive breakfast buffet in Vox, which features a wide variety of eggs, meats, pastries, cheeses, cereals and other breakfast favorites. It’s the perfect way to start your day, and a good place to fuel up for your Reykjavik adventure. And if you should need anything during your stay, don’t hesitate to ask the staff. They are very accommodating, and in fact are the reason the Hilton Reykjavik Nordica truly feels like a home away from home.